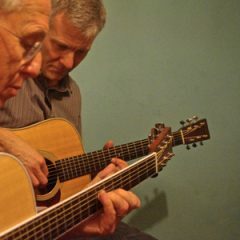 Peter Webster and Ross Fergusson are a duo who weave a web of mellow acoustic tones, finger-picking their way through delicate riffs and lively rhythms. Their two guitars and the occasional burst of harmonica accompany an unusually wide range of songs. Peter’s sure and distinctive voice (often compared to the voices of better known names) beckons audiences through a rich mix of lyrical originals, little-known covers, reflective ballads and some novel interpretations of folk and popular classics, all pepped up with the distinctive Webster-Fergusson twist: a hint of blue notes, or some gently jazzy undertones and rhythms.